I have a confession to make: I love chicken schnitzel. I love it, I love it, I love it. It is so tasty. But this does not mean that I get to actually eat it very often. The last time I ate it was the last time I was at a German restaurant. And that was back when there was actually snow on the ground, so it’s been many, many moons. Surprisingly enough, I had never made schnitzel, myself. I thought, for some reason, that it was a really tough dish to make and that I wouldn’t get the knack or do it justice. After watching the Food Network over time, I have learned this is not so. And since hubby had picked me up a meat tenderizer at one point, I thought this week I’d try my hand at it. I only wish that I had a third hand to take pictures, because this was so incredibly easy that I want the world to know and have everyone make their own because it is just so darned yummy. So, I started with 4 chicken breasts, a freezer-grade ziplock baggie (large), my tenderizer/mallet and a cutting board. Doing one chicken breast at a time, I placed each breast beneath the plastic baggie, then hammered the living you-know-what out of it. When it seemed I wasn’t going to get it any flatter, I flipped it over and hammered it on that side, until I had something no thicker than 1/4-1/2 of an inch in thickness. Each breast was placed aside on a plate. Why the freezer-grade ziplock? I find it’s stronger than cling-wrap, so it won’t tear under the mallet. My mallet has poke-y bits on it and would tear up a thin piece of cling-wrap very easily. Use what works for you. So then I set the mallet and cutting board in the sink to be washed up, washed my hands, then pulled out three large bowls (you can use pie plates or whatever). One, I tossed some flour into. The second one, 3 or 4 eggs, beaten. And the third got filled up with seasoned breadcrumbs (store-bought, but feel free to use homemade if you’re inclined!). Each flattened out breast was first coated in flour (taking time to shake off any excess), then egg, then breadcrumbs. Each one was then set one atop of the other on a fresh plate. These were covered in cling-wrap, then set in the fridge for 30 minutes to allow the breading to set. In a pot, add the cooked egg noodles and some butter and cream, and warm this over a medium-low heat. Stir in the red pepper, garlic and half of the green onions. Add the tomatoes and green peas after the peppers seem softer, as well as some parmesan cheese. Stir until cheese is melted/incorporated and peas are warmed through. Serve with a sprinkling of parmesan cheese and some of the reserved green onion. 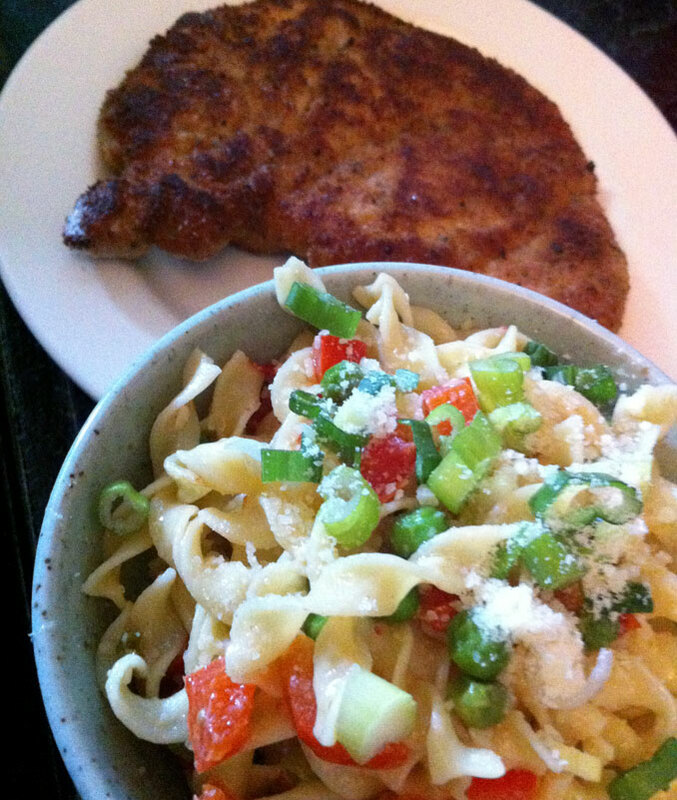 This entry was posted in comfort food, dinner, Lunch, recipe, stove-top and tagged baby tomatoes, bread crumbs, butter, chicken, chicken bouillion, cream, egg noodles, eggs, flour, garlic, green onions, milk, peas, red pepper. Bookmark the permalink.